requirements and source equipment from quality suppliers around the globe. Our engineers provide installation and guaranteed aftersales field support. The man behind DBC, the go-to-man for all your broadcasting and security needs is Frank. 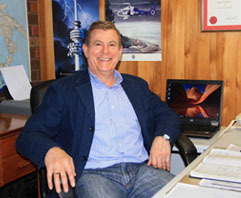 Frank has been in the business of providing equipment to Australian radio and TV networks for more than 30 years. He is well known in the industry for his prompt service and support to his customers. Frank established DBC in May 1999. Since its inception, DBC’s business has steadily grown with sales of AM and FM radio transmitters, TV transmitters, microwave links and peripheral RF products not only to Australian broadcasters, but also to clients in the South East Asian region, Afghanistan and the South Pacific islands. Frank is regularly seen chatting to visiting clients and exhibiting suppliers at broadcast conventions such as NAB, IBC, BroadcastAsia and SMPTE. In the years pre-DBC, as Broadcast Sales Manager with NEC, BTS/PHILIPS, TALIA and MASER, Frank gained invaluable expertise, which he now successfully employs in the operation and management of DBC.